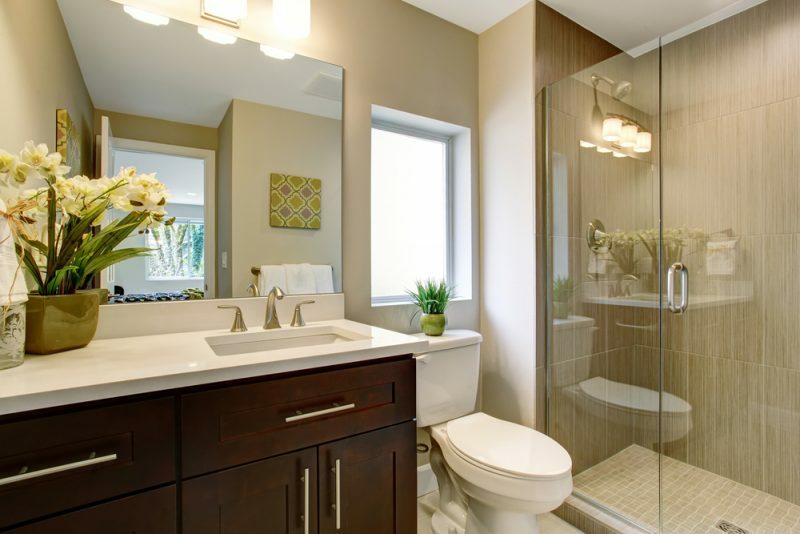 Your bathroom is undoubtedly the most functional room in your home. With all the time you spend in there, it only makes sense that you want to make it as beautiful as you can. However, this can pose a challenge for those who have small bathrooms, because how can you create a room that is both parts functional, beautiful, and cosy? In fact, there are a lot of easy fixes to your bathroom remodel that will make a small room look large. Here are some of our favorite tips to keep in mind when you start demolishing. If you don’t use your bathtub, consider removing it and adding a walk in shower. Not having a clunky tub can easily open up the space, and a sliding glass door will be helpful to bring light into the space. If you need extra storage in your shower, you can always add some built-in shelving. The first thing a visitor notices about a room is the floor. So to really pack a punch, you want to make your bathroom’s floor the main focal point of the room. Small bathrooms look great with patterned tile flooring, such as a mosaic or a black and white checkerboard. For extra pizzazz, put a different pattern tile on your shower floor than the rest of the room. We know that storage is incredibly important in a bathroom, but it just may not be possible with a small bathroom. One of the easiest ways you can bypass a storage solution problem is by investing in a really unique vanity with tons of storage. You use your vanity for plenty of things, so having all of your storage be in this fixture is the easiest way to cut down on clutter around the rest of the room. Whether it is long and tall, short and squat, metal or wood, a good vanity will serve as an all purpose go-to in your bathroom. Shelving and storage is so important in any bathroom, so why not maximize space and extend your countertops over the toilet and across three out of the four walls (the other wall being for your bathtub and shower)? Having one long countertop not only looks unique, it serves a functional purpose and gives more space for decoration. Who doesn’t need a mirror in a bathroom? Go the unique route and mirror your entire space instead of hanging wallpaper or having to paint. This will certainly make a statement, but it will also make your bathroom look much bigger. After all, the more light you bring into a space, the bigger it will seem. Now, you don’t have to mirror the entire room from top to bottom if that is not your style, but you can add plenty of accent mirrors of different sizes and shapes all over the room for a similar effect. Just make sure you angle the mirrors to be facing each other as this will maximize the light you bring in. You can even invest in a mirrored shower door. When home remodeling in Northern Virginia or anywhere else, make sure to use these tips to ensure your bathroom is big, spacious, and functional. Feel free to get creative with your remodeling ideas and use these tips and tricks as a vantage point, and get ready to have the best bathroom on the block.